It is indescribable- the love that flows when an acute or chronic pain is healed with Sujok. “<<HE intentionally created>> our Hands and Feet showing similarity to our body. ..What’s the Purpose? HE wants <<to HELP us>>. Why does HE want to Help us? Because HE <<Loves us>>. HE deliberately chose to put body similarity on <<Hands>> and <<Feet>> because they are easily accessible to us all our life. This expresses HIS eagerness to inform us about this healing system. This is a clear evidence that HE Loves us.” ~ Prof. Park, Jae Woo, ‘Sujok Ki’. Prof Park, Jae Woo mapped the development of emotions and their correspondences in the hands and feet. For today, when many people in the world celebrate Valentine’s Day, a day of expressing love to family, friends, colleagues and beloveds, what is the place where Prof Park, Jae Woo mapped the emotion of love? 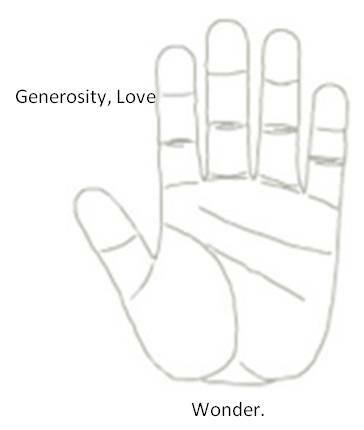 Touch that joint in a mudra and experience the wonder of the generous gift of love given to us to heal self and others. When you’re ready to learn Sujok Therapy, contact us. Posted in Practicing Su Jok and tagged generosity, love, sujok, wonder on February 14, 2015 by GlobalIndiaSujok.